San Mateo, Calif. – September 19, 2014 – Speck, the award-winning leader of mighty slim protective cases and covers for smartphones, tablets, and laptops, today announced the availability of iPhone 6 cases and iPhone 6 Plus cases. The line up includes two brand new cases designed by Speck, MightyShell and MightyShell Clear, its most protective cases yet. MightyShell harnesses 2x military-grade protection into a surprisingly slim profile making it the best defense for the slimmer-than-ever iPhone 6. 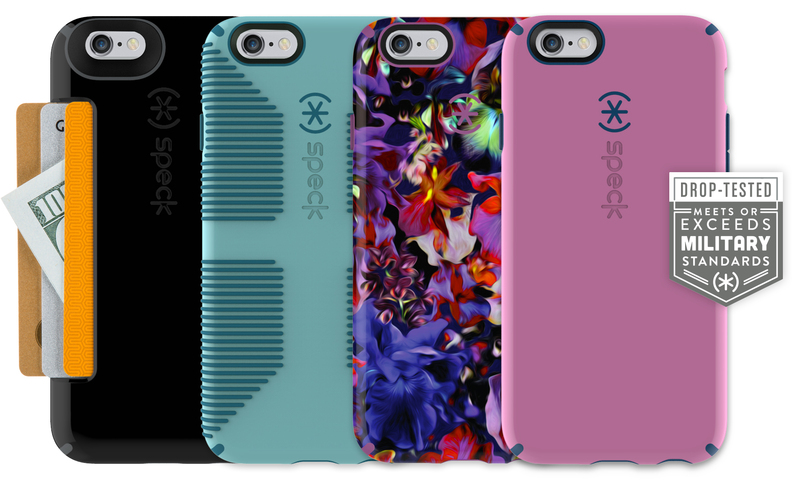 Speck is also unveiling its iconic CandyShell, CandyShell Inked, CandyShell Grip, and CandyShell Card, all featuring military-grade, bulk-free protection for iPhone 6 and iPhone 6 Plus. Speck is an award-winning leader of mighty slim protective cases for the world’s top smartphones, tablets, and laptops. Our roots are in the heart of Silicon Valley, at the intersection of design and technology, inspiring forward-thinking innovation to craft masterfully engineered and patented designs. Our design philosophy delivers the best looking and most effective slim protection because we believe protection doesn’t need to be ugly, nor bulky. It’s all in the details; we create our cases to enable you to go more places and enjoy more from your mobile devices. Get to know us at speckproducts.com or follow us on Twitter, Facebook, Instagram, and Pinterest. Learn more on the FAQs for our CandyShell line for iPhone 6 and iPhone 6 Plus. Learn more on the FAQs for MightyShell and MightyShell Clear for iPhone 6 and iPhone 5s/5.